After I get this here article done, I am going to submit it to the Irony Board for approval. Unfortunately, the words irony, ironic and related words are greatly overused, and often incorrectly. I've been confused myself because of seeing many instances of, "This is ironic..." that may or may not have been used correctly. Seems that quite a few people are uncertain about the proper usage, and there is a site where someone can ask if something is ironic. What is the real meaning? The Cambridge Dictionary defines it as, "a situation in which something which was intended to have a particular result has the opposite or a very different result". But irony has several meanings and applications, which includes using it as a literary device. 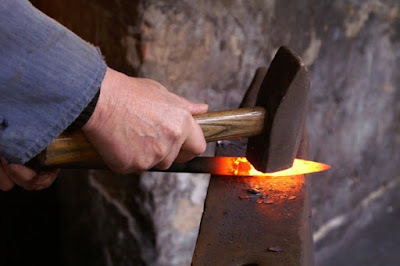 Using this picture of iron in an article about irony is a play on words, it is not ironic. I've been accused of unintended irony against myself on occasion, but those were from people who were on the prod and looking for excuses to indulge in vituperation. One time, I used a video clip of the "holy hand grenade" from Monty Python and the Holy Grail in an article. Why? Because it was funny, and seemed to fit. Someone commented that I was stupid and the Python boys were ridiculing religion. Even if his claim was true, his remark was an ad hominem and irrelevant. More recently, I see angry atheists attack The Question Evolution Project for discussing logic and pointing out reasoning errors from atheists and evolutionists. They claimed that it was ironic for creationists to be discussing logic. No, that's just another ad hominem coupled with the genetic fallacy. Used under Fair Use provisions for educational purposes. Okay, is it ironic that I obtained this screenshot while I was commencing to write this article? Not that I can see. Interesting timing, yes. Anyway, it is ironic that atheists pretend to be the arbiters of reason and science, but frequently display ignorance of both. Indeed, creationists often have to correct village atheists regarding their own evolutionary faith, as well school them on logic. They claim we're ironic, but they disunderstand that their own fallacies are the real ironies. Seems to me that it's ironic that leftists will call people they dislike "fascists", "Nazis", white supremacists, while embodying fascism themselves — especially suppressing free speech and free thought. Taking cues from leftist movements, atheists and other anti-creationists, many of these are leftists, will indulge in the same things. When we ban trolls, we're "fascists" and engage in "censorship", then they seek to recruit others to join in with their tantrums, demonize those they dislike, and more. Most professing atheists are leftists, and they want the opposition (especially creationists) silenced. They irony of their hypocrisy escapes them. I think the psychological term of projection applies here as well, since it is common in certain personality disorders. Moving on up the trail to where I really wanted to go with this, there are times when I've used some things to be ironic. "Memes" with atheists, more Monty Python material, and so on. (One bit of unintentional irony was when I used a Gandalf "meme" with Ian McKellen, and didn't know that he is an atheist.) Sometimes my use of cowboy lingo is purposefully ironic. Also, I think it's ironic that the Christian parody band ApologetiX uses secular songs and rewrites the lyrics to convey biblical truth, such as taking "(I Can't Get No) Satisfaction" by the Rolling Stones and making it into "Triune Godhead". Something else that I find ironic is that evolutionists have methods that they claim show the earth (and the universe itself) to be ancient, and creationists often use their own assumptions against them to obtain far younger results. Also, dinosaurs are icons of evolution, but creationists use them to spread the gospel mesage — Ken Ham calls them "missionary lizards". Sort of like a a gunslinger who gets shot with his own gun. So, yes, I use ironic things in posts and articles. It's fun, adds a bit of "color" to posts and articles, and is also a way to communicate some points. Other ironies are more subtle and you need your cognating cap to figure them out.